Multi-talented performer Billy Eckstine, known as “Mr. B.,” was a jazz musician and balladeer who gained popularity during the post-World War II era. His good looks, fashionable style and smooth baritone vocals led to a long and successful musical career, earning a place as Down Beat’s most popular singer for five consecutive years. He was born William Clarence Eckstein in Pittsburgh, Pennsylvania on July 8, 1914. Eckstine learned to play piano as a child and became a teen football star. Around 1930, Eckstine moved to Washington, D.C., to live with an older sister and later attended St. Paul Normal and Industrial School in Lawrenceville, Virginia where he worked on a degree in physical education. Eventually he transferred to Howard University. After winning a singing contest in New York, he dropped out of college in 1933 and began club appearances in Detroit, Buffalo, Pittsburgh and Chicago. Around this time, he changed his name from Eckstein to Eckstine (his grandparents’ original spelling) and acquired the nickname “Mr. B.” Bandleader Earl Hines heard Eckstine’s act and hired him as its lead vocalist in 1939. While working with Hines’s band, Eckstine recorded “Jelly, Jelly,” and “Skylark.” Both songs became national hits. Although a proficient trombonist, Eckstine also learned to play trumpet and performed with musicians Charlie Parker, Dizzy Gillespie and Sarah Vaughan. In 1943 Eckstine formed an innovative swing band that specialized in bebop. Before disbanding in 1947, Eckstine played trumpet alongside musicians Lucky Thompson, Dexter Gordon, Fats Navarro, Art Blakey, Eugene Ammons, Kenny Dorham, Miles Davis, Oscar Pettiford and Clyde Hart. In the mid-1940s, Eckstine turned to solo vocal recordings and had a stream of hits including “Blowin’ the Blues Away” (1944), “Opus X” (1944), “Everything I Have is Yours” (1947), “Blue Moon” (1948), “Caravan” (1949), and “I Apologize” (1951). In 1945, “A Cottage for Sale” and “Prisoner of Love” each sold a million copies. His discography includes Billy Eckstine’s Imagination (1958), Basie/Eckstine, Inc. (1959), and Billy Eckstine and Quincy Jones at Basin Street East (1961). He also sang a duet with Sarah Vaughan entitled “Passing Strangers” (1957). He appeared in his first film, Skirts Ahoy in 1957. As musical tastes changed, recording contracts became more difficult for Eckstine to obtain. As a result, from the 1960s through the 1980s Eckstine primarily performed in live shows. He toured all over the country and had a brief role in the 1975 film Let’s Do It Again. Eckstine married and divorced his first wife June although the dates of the marriage are unclear. In 1953 he married his second wife, model and actress Carol Drake. They had seven children before their 25-year marriage ended in divorce in 1978. 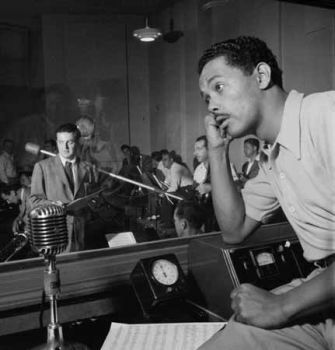 After suffering a stroke in 1992, Billy Eckstine died in Pittsburgh on March 8, 1993. Paula Conlon, “Billy Eckstine,” in African American National Biography: Volume Four, ed. Henry Louis Gates, Jr. and Evelyn Brooks-Higginbotham (New York: Oxford University Press, 2008); Richard Severo, “Billy Eckstine, 78, Band Leader and Velvet-Voiced Singer Dies,” New York Times, 9 March 1993; Scott DeVeaux, The Birth of Bebop: A Social and Musical History (Berkeley: University of California Press, 1997).